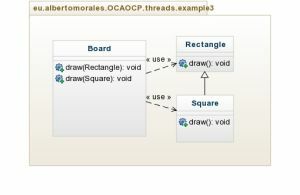 Class Board has two methods with the same name (draw) but with different argument list, which means the method is overloaded. One of them takes a Rectangle and the other one takes a Square. the overloaded method of class Board that takes a Square will be invoked. We can create an instance of Square, and reference it as a Rectangle, because a Square object is still a Rectangle. What happens if you pass an Rectangle reference to a Square object, as an argument to the method draw() of the class Board? If you pass a Rectangle reference, the overloaded method of Board that takes a Rectangle *will be invoked, even if the effective object being passed is a *Square. How do overloaded methods work? Remember, which overloaded version of the method to call is based on the reference type of the argument passed at compile time.